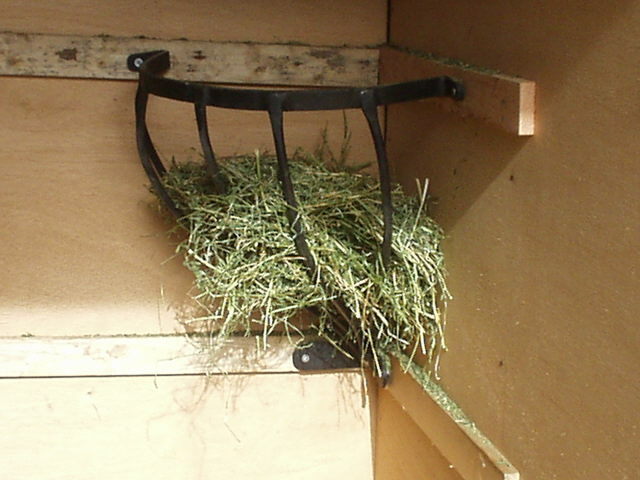 Corner hay manger is great for tight areas. Along with the bucket holder Bob made this for Rita when she got my miniature horse, Buster, he also made a hay manger. He mounted it in the corner of Buster's stall and it worked perfectly for him. Hand Forged. Approximate size: 20"x20"x12". Made with 1" flat stock by 1/4" thick and 1/2" round stock. The size, shape, and weight of this item means we must charge an additional $15 shipping fee to our flat rate shipping rate to accommodate for the actual cost of shipping it.